.....because every Christmas could be the last Christmas you have with a person. That really, really struck a nerve with me. It gave me a twinge. Not unlike the strange compulsion I had to take a photograph with my lovely Nanna at Christmas in 2014. That was the last Christmas we had with my lovely Nanna. She left us shortly afterwards. When I went to hug and kiss my beloved Grandad goodbye this Christmas past, he staggered slightly and knocked over an ornament. We laughed and blamed the shandy he'd drunk with dinner. That was the last Christmas we'd have with him. He left us on January 29, my lovely Nanna's birthday. I don't have proper words for what he meant to me....so much of every happy childhood memory is tightly woven with my grandparents presence and influence. They were everything that was joy and delight and magic. 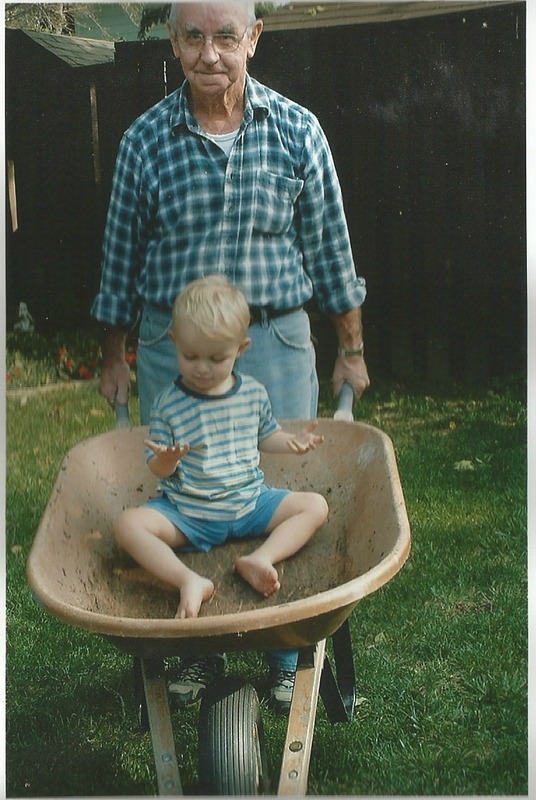 My Grandad was my champion, through and through. I get my love of gardening and growing things from him. He taught me so very much, including the very Zen attitude of "It's got two chances" - which is to say, either a plant will survive or it won't. I don't think he enjoyed gardening here, in Canada, as much as he did at home, in England. I think he regarded the Canadian climate as being far too inhospitable for much. He never quite got his head around the fact he needed to water things. Still, there were always a few tubs for tomatoes and he planted his own hanging baskets for around his little patio. In recent years, the tending of larger beds became too much for him and so he put in easy-keeping hostas and shrubs to fill the spaces. He still mowed and raked leaves and shoveled his driveway in winter. He was vibrant and active right up until his diagnosis of a brain tumour. In three short weeks he became an old, old man and then he slipped away - at peace and content, with dignity and a sure knowledge that his sweetheart was waiting for him. The year has got off to an horrific start, there's no other way to put it. The loss of my Grandad is only part of what we're dealing with here, chez Wuthering Heights. My darling girl-child is struggling terribly with a debilitating and frightening mental illness (which has required a stay in hospital) and we're all feeling battle-weary and emotionally ragged. We have a long and arduous road ahead of us and while, at times, I feel quite hopeful, there are other times when I'm laid low with a sense of crushing despair. I'm finding solace in the simple things - tea, a towering stack of library books and beautiful letters from treasured friends. When things are particularly dark and dire, I plod through the snow to fill the bird feeders...even when they don't really need it. And while this isn't the sort of post I would've planned for my return to the webby spaces, it certainly honours my commitment to write about the real things -- to keep a chronicle of my days, warts and all. Because despite the burden of woe that I'm carrying, there is still a great deal of joy to be had. There are blue shadows on the snow and the sparkle of sunlight on ice-encrusted branches to offer momentary respite from the worry and the deep, deep sadness. That, I think, is something.